The Golden State Warriors are, by normal NBA standards, having a great season. But the Warriors are not a normal NBA team, and their 126-91 loss to the Dallas Mavericks on Saturday added another puzzling home blowout to their campaign. The 35-point defeat was the largest home loss in the Steve Kerr era and their largest defeat of the season, just 18 days after what had previously been the biggest home defeat in Kerr’s tenure — a 33-point loss to the Boston Celtics — and 13 days after they were defeated by the conference-worst Phoenix Suns at Oracle Arena. Granted, the Warriors were without Stephen Curry, Shaun Livingston and Andrew Bogut on Saturday. But they still held a formidable talent advantage on the 28-44 Mavericks, who looked like the Warriors the way they shot the ball, striping 21 3-pointers. 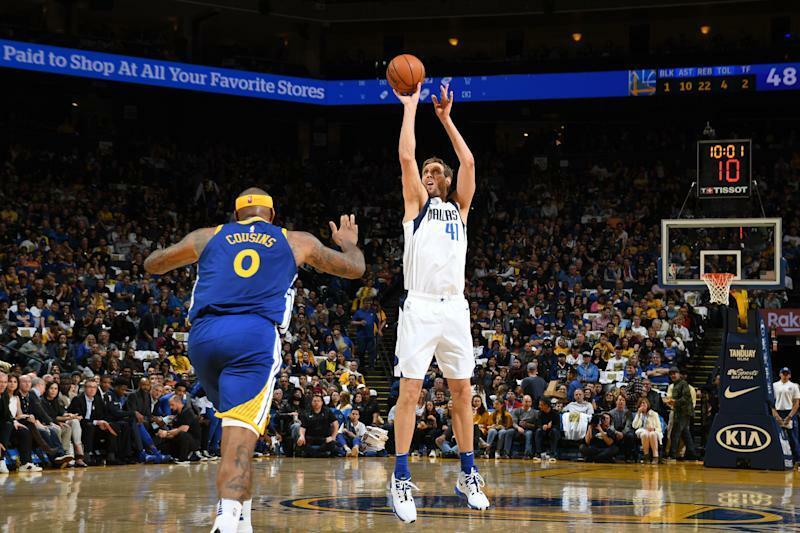 And it was vintage Dirk Nowitzki for the Mavericks — Dirk hit five threes en route to a 21-point performance. The Warriors seem to operate just fine without Kevin Durant in the lineup. But without Curry, Golden State is barely scratching .500. Since the start of 2014-15, Golden State is 26-24 without Curry. That's about to be 26-25. This has a lot to do with how much the Warriors’ offensive system runs through Curry’s shooting prowess and ability to stretch the floor. Though the Warriors have a gluttony of All-Stars outside of Curry, it’s the two-time MVP who is the creator on the offensive side of the ball. Saturday was a prime example, as the Warriors struggled from the perimeter, shooting just 13 percent (4 of 30) from 3-point range, a season low. Klay Thompson had just eight points and missed all four of his 3-point attempts. Durant finished with 25 points, but clanked all eight of his attempts from beyond-the-arc. Those are numbers that the Warriors just don’t put up. Klay Thompson: "When you shoot 13 percent from 3, that's never a positive." As last season dictated, the Warriors don’t necessarily need the first seed in the West to win a championship. At certain points this season, they’ve played like they don’t care about seeding. But Saturday’s loss dropped them to 49-23, a half game back of the Denver Nuggets for first in the West. The Warriors have routed the Nuggets in the two teams’ past two meetings, so they’re not scared of playing Denver without home-court advantage in a potential playoff series. But during the Warriors’ recent dynasty, no regular season has been as rocky as this one, with head-scratching home losses where they simply were rolled by inferior opponents. That’s not to say they aren’t capable of just turning it up in the playoffs when the games really matter, but there is no doubt that Kerr and the Warriors would hope to take care of business against bottom feeders at home.